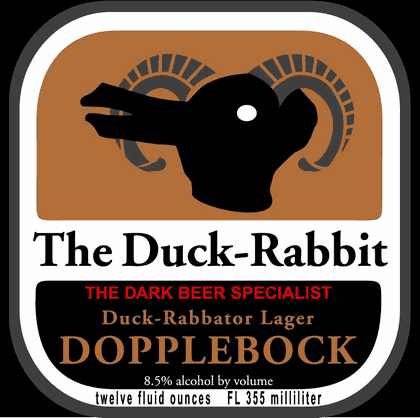 Even though my tastes skew lighter rather than darker, I have a huge soft spot for North Carolina's Duck-Rabbit Craft Brewery, because owner Paul Philippon is a philosophy geek that named his brewery after a famous Gestalt image from a Wittgenstein text. Once upon a time, I was a philosophy major and loved Wittgenstein. I suppose I still do love Ludwig's work, though I embarrassed myself in a conversation with Philippon by screwing up Kant and Wittgenstein as the authors of the Prolegomena to Any Future Metaphysics (Kant) and Tractatus Logico-Philosophicus (Witt). Somewhere, my old advisor Nate is crying. The horns are a reference to the "bock" in Dopplebock, which is German for "goat." There are lots of theories about why the strong, dark lager got named that, and all of them are totally without evidence. But I like the play by Philippon (who certainly speaks/reads some German), and the adherence to the tradition of naming a double bock [something]-ator. The name "Duck-Rabbator" makes up in simplicity what it lacks in imaginativeness. Speaking of things I like: Penguins. Love 'em. They're adorable, they're endangered, they're a one-animal argument against intelligent design (it's a bird that doesn't fly but can swim at 20 miles an hour, so of course they waddle for hundreds of miles to mate and eat). 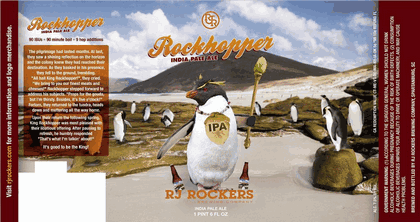 And Spartanburg, SC's RJ Rockers is the latest to put them on a beer label. Bonus points for leaving the more famous Emperor and King Penguins in favor of the more sprightly and colorful Rockhoppers. If I could buy this beer in PA, I would. Instead, I'll have to go to Maryland. Well, there's something else to do SAVOR weekend. 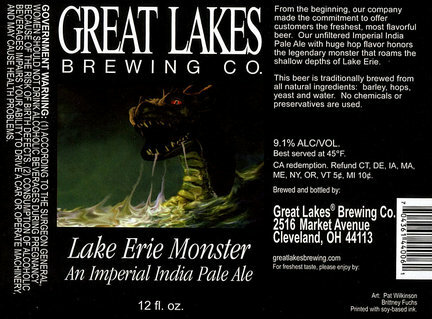 Lastly, the excellent Great Lakes Brewing Company put out a new beer, The Lake Erie Monster. So far as I know, no such monster exists, but [make your own Cleveland joke here]. The artwork, if a bit reminiscent of Magic cards, is suitably frightening, and the blue-green color palette makes the red eyes pop. The beer in question will be an unfiltered imperial IPA, so I'll look forward to drinking it.